Independence Day is the National Day of the United States. It’s the day we celebrate the adoption of the Declaration of Independence on July 4, 1776 declaring the American colonies as a new nation. Americans mark the occasion with barbecues, parades, community celebrations, picnics, family reunions, and perhaps everyone’s favorite —fireworks. July Fourth is also the day some of us celebrate the semi-famous “Lake Murvaul Fireworks Incident” of some year ago. 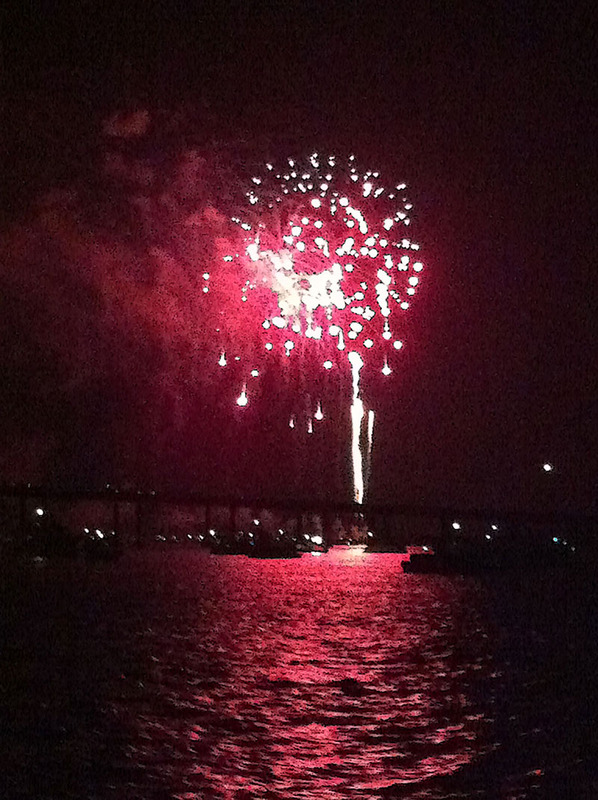 In case you missed that one, it was the night my son, Lee, lit up the sky over the small East Texas lake. Like many young boys, Lee loved fireworks with a passion to the extent that for years, I was pretty sure he was a pyromaniac. His artillery stash for this particular night rivaled a military weapons depot. Truly, he was equipped to defend the south shore of Lake Murvaul against any invasion, should one occur. As dark descended on our Panola County lake house, Lee was ready. He had carefully stored every piece of his arsenal in a plastic container to keep them dry and safe from the firing line. Seemed like a smart move to me. Families along the shore migrated to piers with lawn chairs and refreshments. Lake Murvaul was then, and is today, regarded as an excellent place to view fireworks displays staged by residents around the lake’s perimeter. Shooting fireworks at the lake means launching them from piers. Not only is it safer, it’s also a Murvaul tradition to enjoy the numerous shows with family and friends. “Oohs” and “aahs” rose from the darkness of nearby piers as brilliant, colorful displays began illuminating the night sky before falling into the placid water below. Certainly, no one was looking for anything spectacular when the small “twirly-thingy” whizzed upward, or even gave a second thought to the still glowing ember drifting downward. I’m pretty sure no one even noticed when the device, blown slightly off course by summer breezes, drifted toward Lee’s stash. However, the instant it hit the bucket, we hit the road. When the “really big show” is about to begin at your feet, sitting at the end of a 30-foot pier becomes an obstacle leaving just two options for evacuation—go into the water or run. Within milliseconds, four people broke into a sprint down the pier toward land. That would have been fine, except the pier was wide enough for only one person at a time. Curiosity got the best of me. I stopped and looked back at the inferno. Funny, at that same instant, a Bible story crossed my mind—the one about Lot’s wife. As I looked through the boathouse door out onto the deck, I saw several things. One, I saw a fireworks display the likes of which I’m pretty sure had never before been seen on Murvaul, perhaps never since. Rockets shooting one direction, bombs going off in another. Whizzers, climbers, flares and twisters. The light was blinding and the noise was deafening. Not since Wolf Blitzer’s CNN coverage of the invasion of Iraq, had I witnessed such firepower. Next, I saw my pier beginning to burn. I knew it would eventually hit the water, but it also occurred to me that I was standing on it. Last, I saw neighbors in both directions hunkering down, dodging bottle rockets while folding lawn chairs and scrambling to get off their own piers. Then an idea hit me. Using a broom in the boathouse, I reached through the door and pushed what was left of the inferno off the pier and into the water. With a muffled sizzle, the mass of embers, melted plastic and still detonating devices sank in a cloud of steam that lingered over the murky depths. Almost as fast as it had started, the show was over. The silence was deafening. Not one single flash of fireworks could be seen on the water. Not one frog or cricket was singing. Then it started. First with my neighbors, then spreading around the cove and across the lake, applause and cheering that lasted for several minutes. My son was devastated. He had just watched weeks of allowance and pay for extra chores go up in a flash. He was out of fireworks and the evening was still young. Then in an act of sympathy and compassion, his sister, Robin, shared her fireworks with him. I was impressed, but had to wonder what this would cost Lee at some later date. My son was famous. For weeks, people asked, “What was that over there on the south shore the other night?” Everyone was pretty sure it was the most spectacular event since lightening hit the oil storage tanks. The legend of the biggest fireworks display ever was still being talked about the day we moved away. Enjoy the holiday weekend as we pause to celebrate this great country, say a prayer for the men and women in the armed services who will be working to protect our freedom—and remember the semi-famous “Lake Murvaul Fireworks Incident” if you’re celebrating with fireworks.